Approximately 450 km away from Rio de Janeiro, is the capital of the Brazilian State of Minas Gerais. This part of our country is one of the most important regions of Brazil's history. It is also one of Brazil's most scenic regions. Although the town itself was founded around the turn of the century, it has over 3 million inhabitants and is already the Brazil's third largest city. The town lies in mountainous landscape and is the starting point for the many excursions into the historical Minas Gerais region, e.g. 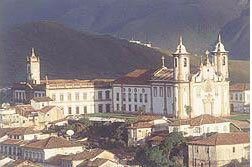 Ouro Preto, Congonhas do Campo, Mariana, Tiradentes, Sao Joao del Rey and Sabará. Furthermore we offer excursions to visit the gold mines and sites where precious stones have been found. These tours are excellent as general education experiences or as professional visits for technicians and scientists. In addition to these regular excursions from Belo Horizonte, we also offer a series of special Interest Tours in the state of Minas Gerais.